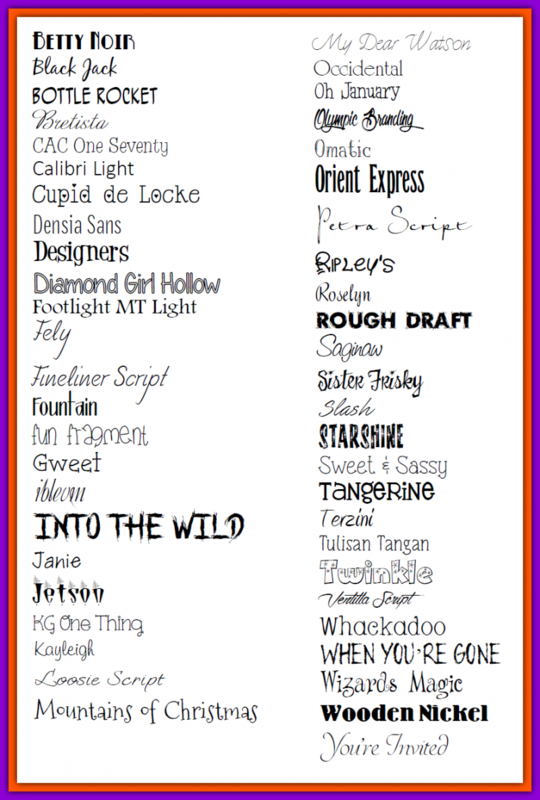 These are just a few of the fonts I use to make flyers, forms, etc. They are free, so enjoy! I have an image of the fonts listed below to give you a better idea of what each font looks like before you download it to your computer. Scroll down under the links below to view the image. You'll need to DOWNLOAD a font to your computer to be able to VIEW the file. Just click on the name of the font, a box will pop up asking you where you want to download the font (I usually make a new folder to download fonts to before I add them to my computer). After you've saved the font to your computer just click the font and you'll get a pop up box showing you what the font looks like....you can then click INSTALL (at the top of the box) which will automatically download the font to your Windows Fonts folder. You're done! You've just downloaded a new font and will be able to use it wherever you like! Once you've installed the new fonts to your computer, pull up the original WORD document again. You will now be able to view the original document along with the fonts that were used to make that document. You will also be able to make any changes you need and still keep the integrity of the original document. I'll be adding fonts as I have time. If there was a font on the old pages that you remember, please let me know and I'll try to get it uploaded for you. If you find a broken link, please let me know so I can fix it right away.